Bottle Gourd (Sorrakaya/Anapakaya/Lauki/Doodhi) is an extremely healthy vegetable which we or me personally ignored all through my childhood. My mom used to take extra pains to make it palatable to us. But as kids we never appreciated her efforts. Lot of kids I knew didn't like the taste of this vegetable. So it was normal for me at that time. Later on, I kind of took a liking towards Bottle Gourd and here I am blogging about the health benefits! Today, after reading this article, some of you might want to change your preferences! One way to enjoy Bottle Gourd Curry is here. Peel and Chop the bottle gourd. Cook them either in the microwave or pressure cooker or on the stove top. Meanwhile, roast the peanuts and dry red chillies and powder them along with the rest of the ingredients listed under 'To Grind'. In a heated wok/kadai add oil and the rest of the seasoning. After the mustard seeds crackle, add the boiled bottle gourd and turmeric. Stir in the spicy powder and salt to taste. Adjust salt and the spice. If needed add a couple tablespoons of yogurt/curds or milk to adjust the consistency. 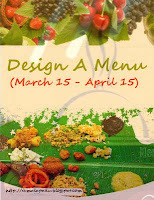 As per the menu I created for the Design A Menu event happening here in 'Tamalapaku', sending this curry to the event. Curry looks inviting and simply fabulous..
Sorakaya kura looks delicious Harini. I even add some tamarind and jaggery to make it tangy and slightly sweet. I love bottle gourd cooked this way- the peanuts give such a nice sweet nutty taste! Nice one. Your version reminded that I have a similar one in drafts from ages. :) I could have sent it to you. I always liked lauki with coconut and South Indian style seasonings. Have to prepare gravy version for the rest of the family now to lure them. very innovative...peanuts with bottle gourd!....looks delicious! Very delicious and colorful looking curry dear. Excellent recipe. Love that curry...Simple and filling! !